NASA's Cassini spacecraft revealed this view of the Saturn with its main rings. The planet glows in natural color, as human eyes would see it. 36 images in three color filters combine in this mosaic, obtained by Cassini's imaging science subsystem on Oct. 10, 2013. Saturn and its dazzling rings glow in an amazing new portrait captured by NASA's Cassini spacecraft high above the gas giant planet. 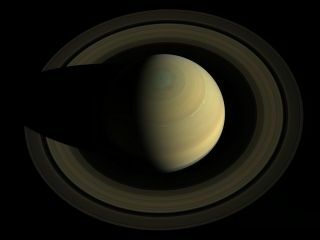 The new natural-color picture of Saturn by Cassini shows the planet and its rings as human eyes would see it. The photo actually represents a mosaic of 36 images taken on Oct. 10 using three color filters on Cassini's imaging science subsystem. The view features the colored bands of weather in the ringed planet's atmosphere. A bright wavy stream of clouds around 42 degrees north latitude arcs around the northern hemisphere like a golden collar. These clouds may mark turbulence from a monster storm on Saturn that peaked in early 2011. Crowning the top of Saturn in the image is a strange hexagon-shaped feature that surrounds the planet's north pole. The phenomenon remains unexplained by researchers, although measurements show that the six-sided shape is large enough to contain four Earths. Cassini arrived in orbit around Saturn in 2004, during the northern winter, when more of the northern hemisphere appeared bluish in color. At the time, golden tones characterized the southern hemisphere, then in the throes of southern summer. As the seasons have changed, the colors in each hemisphere have begun to change as well. In the new image, the gold hues of Saturnian springtime appear in the northern hemisphere, while the bluish regions are now confined to a tighter circle around the north pole. The southern hemisphere exhibits an autumnal bluer trend. Saturn's majestic rings also appear in this mosaic, including the innermost D ring, and the C, B and A rings. The F ring remains too faint to see here without enhancing the contrast of the image. (Scientists named the rings in order of their discovery rather than their position around Saturn.) The shadow of the rings also falls on Saturn at the limb of the planet in the lower right quadrant. The Cassini-Huygens mission is a cooperative project by NASA, the European Space Agency and the Italian Space Agency. The mission is currently in an extended phase that runs through 2017.